Phillip Beggs joined Moore Ingram Johnson & Steele, LLP in 1986 and is a Partner in the firm’s Real Estate Department. He has handled a wide variety of transactional and litigation matters involving real estate issues over the last 25 years. In the Real Estate Department, he heads the firm’s commercial leasing practice representing clients in lease negotiations and litigation. Phillip also handles closings and sales contract negotiations for property owners, developers, builders and lenders and coordinates service delivery with the firm’s land use practice group for numerous clients. He is the head of our probate litigation practice group and also litigates other fiduciary, commercial and contract disputes. 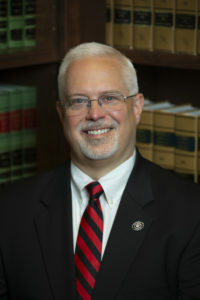 He has served as an active member of the Litigation Section and the Elder Law Sections of the Georgia and Cobb County Bar Associations. Phillip coordinates orientation and recruiting efforts for new associates and summer clerks. Born in Winter Gardens, Florida, March 2, 1961, Phillip was admitted to the Georgia Bar in 1986 after receiving his Political Science degree from the University of Georgia in 1983, and his J. D. from Mercer University School of Law in 1986. Phillip is actively involved with Cobb County Habitat for Humanity, the Marietta Kiwanis Club and Cobb Family Resources. He is also heavily involved with the Cobb Chamber of Commerce, including co-chairing the Year 2000 Leadership Cobb program. A life long resident of Cobb County, Phillip and his wife, Linda, have two daughters, Georgia and Samantha. He enjoys following politics, both locally and on a national level, and hiking in the North Georgia mountains with his family.